You are currently browsing the tag archive for the ‘chaat masala’ tag. Now that summer has been bid goodbye, I look forward to the bounty of winter fruits and vegetables; apples, figs, pumpkins, beets, sweet potatoes…. Ah, sweet potatoes! They take me down memory lane; all the way to wonderful Delhi winters when coal roasted sweet potatoes would make their autumnal appearance in markets everywhere. We lived just a few blocks from the bustling Lajpat Nagar Market, where shakkarkandi vendors would set up shop in their portable hour glass shaped stands, signaling the arrival of winter. I was fascinated by the Delhi markets. I had never before seen a one stop market, where hole in the wall shops, cart vendors, tented stalls and narrow multi-leveled air conditioned showrooms all coexisted in one crowded market square. You could shop for everything from fruits and vegetables to blinged out chappals to exquisitely embroidered shawls to homeopathic concoctions to spare parts for household gadgets and everything in-between. And of course street food, there was always street food. Aloo tikki, chaat and other food carts would be positioned strategically in every market. I’d buy a patha of shakkarkandi, spicy, salty, lemony and sweet all at the same time and gawk at the frenetic shoppers making their Diwali purchases, this time of the year. I used to live in the southern city of Chennai before moving to Delhi, where such markets didn’t exist. It was such a novelty for this new transplant to wander the crowded market while savoring a plate of street food. 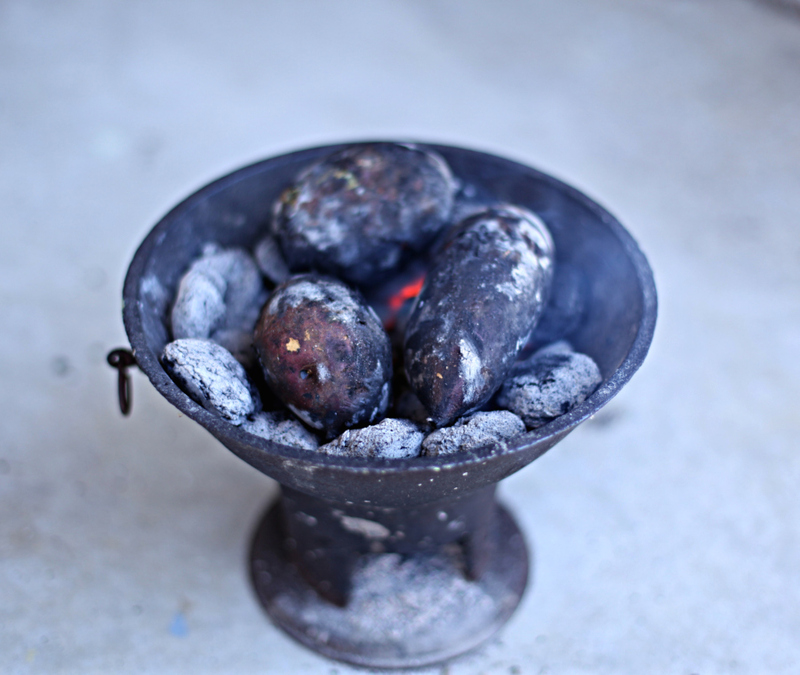 The coal roasted shakkarkandi would be stacked in rows on a stand with tiny lemons and star fruit interspersed among them. 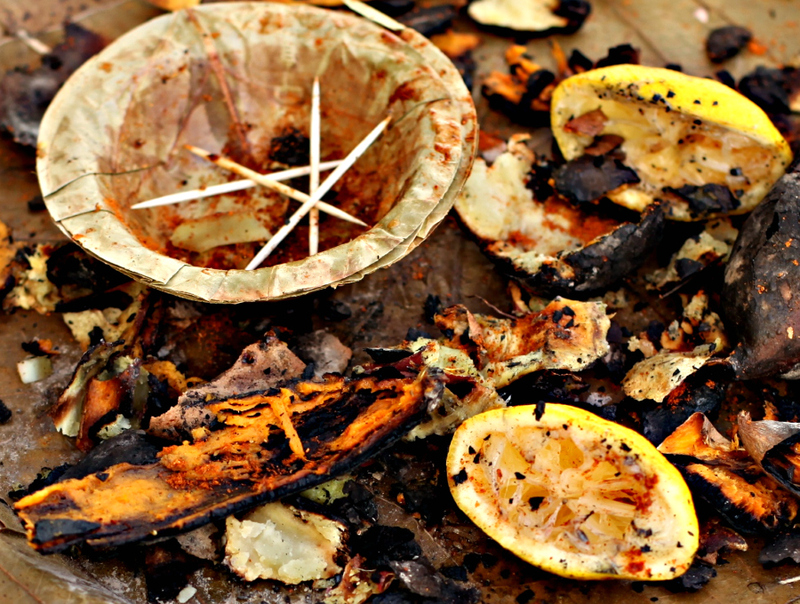 I would wait in anticipation, my mouth watering as the vendor picks a sweet potato warming over hot charcoal and gingerly peels, dices and drops it onto a plate. With a sleight of hand worthy of a magician he would shower the plate with chaat masala, drench it with lemon juice, deftly toss the contents and hand it over with a flourish. I pulled out my coal fired stove and roasted this season’s first batch of sweet potatoes. 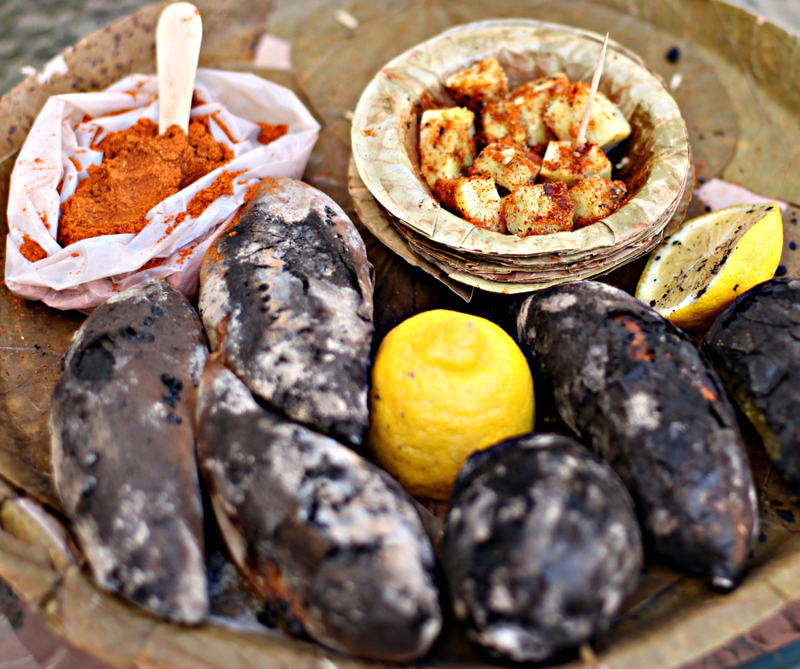 The char and smokiness of the charcoal is essential in creating the unique Delhi taste, though I am sure grilling will work just as well. Alternately you can bake in a standard oven. Chaat masala is widely available in Indian stores. I generally don’t buy prepared spice mixes so I made my own chaat masala. 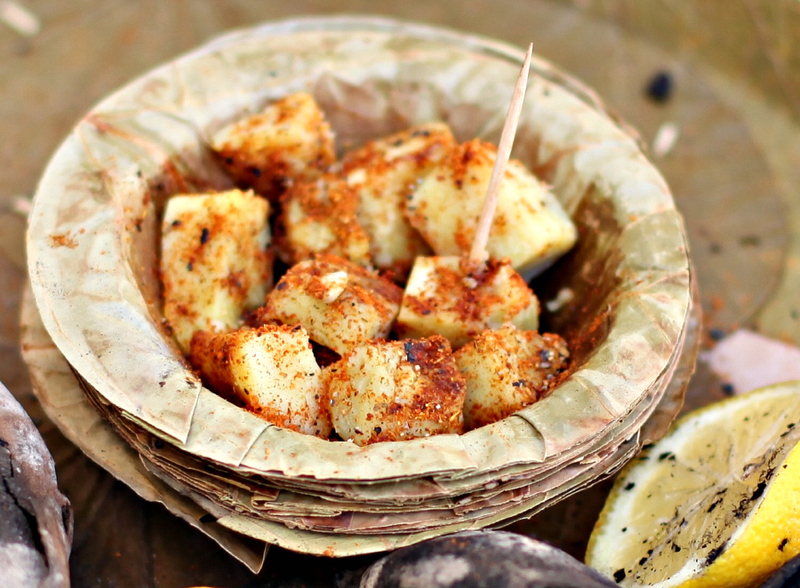 Sprinkling salt, pepper, cumin and chili powder is the next best alternative to chaat masala if you don’t have it. 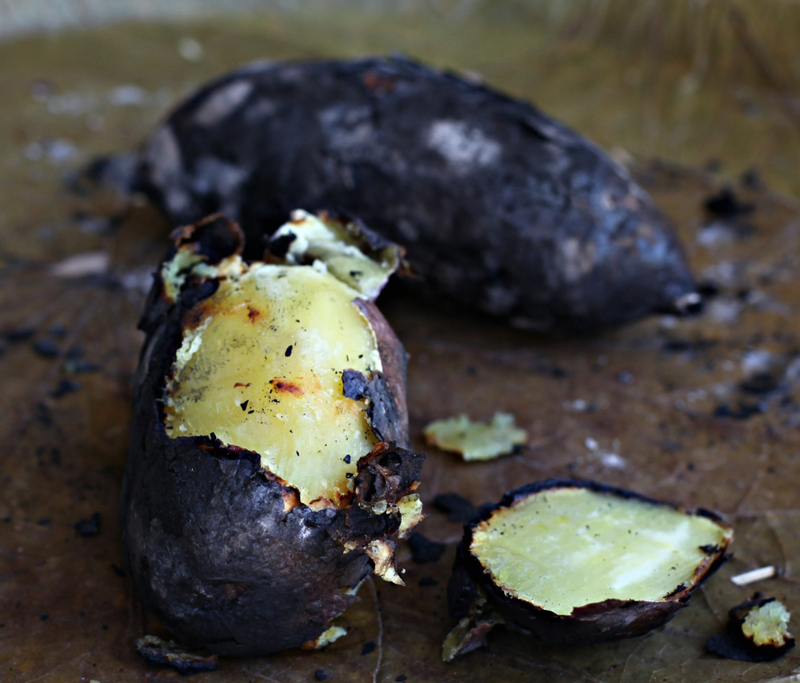 I placed the sweet potatoes directly over the coal and roasted it for 30 minutes turning it a couple of times. Roast with skin on, for about 40 minutes. A tooth pick should pass through, make sure you don’t over cook it. 1 clove, yes just one! Toast the cumin in a pan over medium heat for one minute, shaking the pan to prevent burning. Turn the stove off and add the cardamom, clove and fennel onto the pan and shake a few times to toast these spices also. When cooled put the spices and the rest of the ingredients in a spice grinder and grind to a semi-fine powder. Mix everything, stick a tooth pick and serve.